It is a big deal when the air conditioning goes out on a hot summer day, but there is no need to wait for help to come to you. Many air conditioning malfunctions are not difficult to identify and repair. The following test procedure will help you identify if the problem with your outdoor unit is the fan motor, the capacitor, or the contactor. Make certain the thermostat is set to cool and the indoor unit is running (blowing air out the room air vents). Listen to the outdoor unit for the sound of the compressor running. If you hear the compressor running go to “section A” below. Note, compressors can run quietly. If you cannot hear the compressor running go to “section B” below. You can hear the a/c compressor running and the fan motor is not turning. Because the compressor is running you know there is 220 volts power to the outdoor unit and you know the contactor is doing its job of delivering that 220 volts to the compressor and to the motor. The malfunction will be a bad capacitor and/or a bad motor. 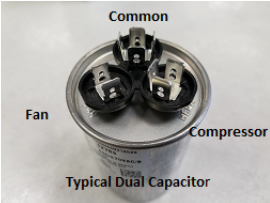 Capacitors can be tested with multi-meters that have the ability to read microfarads or you can take your capacitor (and your motor) to your nearest U-FIX-IT store for a free bench test. If the capacitor tests good then your motor is bad. Caution – Capacitors can store an electric charge (like a battery). The shock hazard is non-lethal, but it is no fun. Check the 220-volt power is off and discharge the capacitor by shorting between capacitor terminals (with an insulated screwdriver) before removing the wires from the terminals. A capacitor connected to both the compressor and the motor can fail on just the motor side or just the compressor side. Bad a/c fan motors can sometimes be started by “spinning” the fan blade with a stick – it is still a bad motor. A capacitor that is “swollen” (a convex shape) on the side under the terminals is a bad capacitor. A dual capacitor powers both the compressor (HERM terminal) and the fan motor (FAN terminal). The third terminal is the common (C terminal). You cannot hear the a/c compressor running and the fan motor is not turning. Your next troubleshooting step will be checking the 220-volt power because it is highly unlikely both the compressor and the fan motor would fail at the same time. 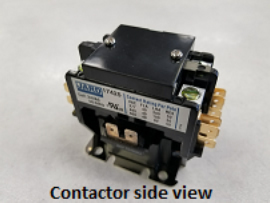 Failure of the contactor (see picture) is the electro-mechanical device that most often produces this symptom. This symptom can also be produced by a bad capacitor. You can prove the contactor or the capacitor is the problem by using a multi-meter or you can take your contactor to your nearest U-FIX-IT store for a free bench test. 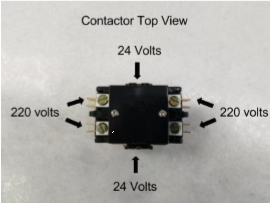 Using a multimeter, verify there are 220 volts going into the contactor, but zero volts coming out of the contactor (to the motor and compressor). Check for 24 volts across the coil terminals. The contactor is bad if multi-meter reads 220 volts going in, zero volts coming out, and 24 volts across the coil terminals. Repair Tip: Before removing the wires from the contactor be certain power is turned off in two places. Electrical power should be turned off at the outdoor unit and the indoor furnace. The 24 volts controlling the contactor originates at the furnace. An accidental touching of the two wires together will burn up the transformer. Visually inspect the capacitor for a bulging top below the terminals. It is likely the capacitor is bad if the terminal end is not flat. A multimeter can be used to check for continuity between the terminals. A bad capacitor that is preventing both the motor and the compressor from starting will not have any continuity between the terminals. Note: a functioning capacitor will show a surge in the resistance and then return to zero (multimeter set to read resistance). Switch placement of the multimeter probes on the capacitor terminals and the “surge in resistance and return to zero will happen again. Some multimeter can read the microfarad rating of the capacitor. Replace the capacitor if it reads less than the rated mfd printed on the capacitor. Slightly higher is OK.
detailed step by step diagnosis tehchnique is very helpful. My outdoor unit fan is running but can’t hear the sound of compressor. Normal temparature air is felt at OD unit when fan runs. What could be the probable cause. I have checked all options from remote. First, thank you for pointing out I have not addressed this symptom in the post about outdoor a/c units. I am assuming the unit has clean coils inside the house and on the outside unit. 1. Test the capacitor for the compressor to make certain it is good or replace it. 2. Check the compressor to see if it is too hot to touch. 3. Turn off power to the outdoor unit and allow the compressor to cool (to the touch). 4. Start the outdoor unit and see if the compressor (a.) starts and runs for awhile & then stops; (b.) tries to start and fails; (c.) never starts or attempts to start. 5. Look for a wiring diagram for the outdoor unit to see if there is anything in the circuit between the contactor and the compressor such as a time delay. 6. Read the voltage at the compressor while the compressor is not running, but the fan motor is running. 7. Write down the brand, model number, and serial number of the outdoor unit. Once I accomplished those 7 steps as best I could, I would call the nearest U-FIX-IT Appliance Parts store for free personalized help in diagnosing your unit. I will make a post in the future that will cover the options in detail, but for this time and space a phone call is the more efficient way to arrive at a conclusion. Thank you for our inquiry. We are looking forward to hearing from you on the phone. What a great and helpful article!